This product is currently unavailable. At this point there is not expected delivery date; it could be several months. We apologize for any inconvenience. This product generally ships out the following business day via FedEx. What do we think about this hoop? 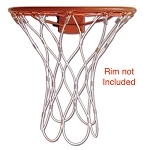 This is one of our most popular Spalding and Huffy (same company now) goals. If you want to get a professional-grade hoop for your driveway you cant beat this system. The comparable Mammoth and Hydrarib goals are several hundred dollars more, but they have the most important thing in common - the backboard is glass. You would be hard pressed to notice a difference in play between them. Most driveways sport an acrylic or polycarbonate board. Those arent bad, but they also dont have a true rebound like this glass model provides. The 88465G not only plays good, but it looks good. It has an aluminum trim on the board which gives it the high school or recreation center professional look. It also has protectants in the board so it will never yellow or fade. In conclusion, this is one of our favorites. Assembly takes about 3 hours, but dont let the installation intimidate you. The majority of people who assemble these are dads and moms using the instructions and general household tools. Contact us if you have any questions at websales@competitiveedgeproducts.com. The 88465 model number was replaced by the glass model 88465G, the difference being glass vsAcrylic. 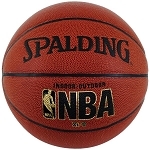 Spalding In Ground Basketball Hoop With 54 Inch Acrylic Backboard generally ships via FedEx. 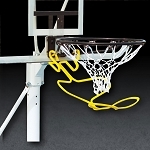 Please see our comparable Lifetime Basketball Hoop | Reebok 59971 system featuring a 4x4 square pole and 54 in. Glass Backboard. Dimensions: 56" x 34" x 7"